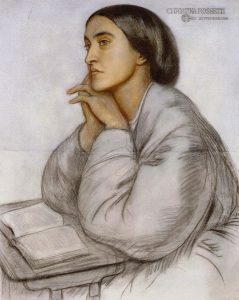 Christina Rossetti (1830 – 1894) never married, (though she was briefly engaged to the artist James Collinson) and yet she wrote some beautiful love poems. We have no idea who the lover in A Birthday is, but that does not matter. What counts is the intense joy of being in love. 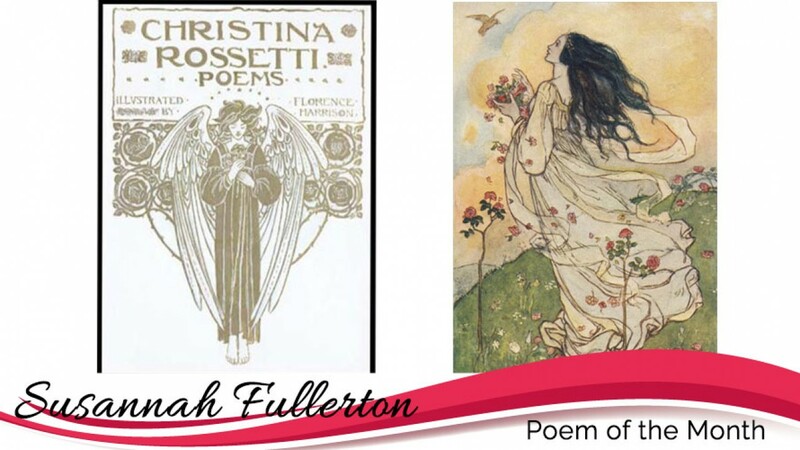 First published in 1862, this is one of the most widely anthologised of Christina Rosetti’s poems. It’s a poem about the sheer happiness of being in love. The first stanza is descriptive, linking her heart to various things in nature which are beautiful and joyful. The references to birds and nests bring ideas of homes and mating, while the ripe fruit suggests fertility. The ‘water’d shoot’ gives the feeling that she has now been ‘watered’ or given what will make her flourish. But many of these images are fragile – the “shoot”, the bent boughs which could easily break under their load, and the delicate shell. The phrase about the “halcyon sea” refers to a Greek myth about a bird (probably a kingfisher) which had its nest floating on the sea and charmed the waves into stillness so the nest wouldn’t be disturbed. The second stanza is imperative, full of commands for ways of honouring her happiness – raise, carve, work, etc. It is full of images of richness and royalty – thrones, purple, vair (costly squirrel fur), the French fleur-de-lys, and a dais, and also images of peace (the dove). It’s as if the poet is preparing for a royal visit, that of the beloved. However, there is also a sense, from the title, that love has brought her a new life so therefore this is a birth day because her life has truly been transformed and started anew. It’s a poem that intimately links love with the natural world. Loving someone is as natural as birds singing or fruit growing. Love brings new beginnings and great joy. I think it is a lovely poem. Share your thoughts by leaving a comment.